The bright maximum aperture of the Samyang 35mm T1.5 XEEN Cine Lens makes it a perfect lens for shooting high-quality video in practically any lighting situation. It's perfectly optimised for shooting stunning 4K, with X-Coating technology and declicked gear rings for smooth focusing action. 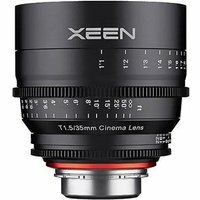 The robust aluminium build and full-frame coverage make this a premium cine lens in an affordable package. This version for Sony E-mount.